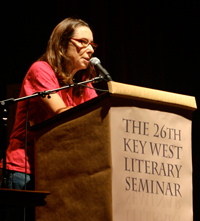 Ann Beattie is the Edgar Allan Poe Chair of the University of Virginia’s Department of English and Creative Writing. A short story writer and a novelist, she has received critical acclaim for her body of work and has been called “one of our era’s most vital masters of the short form” by The Washington Post. In this recording from 2008, Beattie reads from a virtuosic essay-in-progress on the subject of ambient sound in works of literature. Beginning with accounts of poet John Ashbery’s “managed chance” method of composing, the noises of drunken Parrotheads in Key West, and a discussion of clichés “whose repetition deadens language,” Beattie arrives at a luxuriant analysis of technique in the fiction of James Joyce (“The Dead”), Raymond Carver (“Are These Actual Miles?”), and Richard Yates (“The Best of Everything”). This recording is available for noncommercial and educational use only. All rights belong to the author. © 2011 Ann Beattie. Used with permission from Ann Beattie.